Ohio Gov. John Kasich and his long-time Republican friend, U.S. Sen. Rob Portman, have been political soul mates for decades, adopting and defending virtually all Republican policies and programs that have done so much to harm and hurt Buckeyes across the board. Readers are again reminded that Kasich is not the popular “moderate” leader elite east coast and DC beltway media make him out to be, but a radical rightie who wants to put Planned Parenthood (PP) out of business as much as he wants to shutter the Affordable Care Act (ACA) that has helped more than 700,000 Ohioans gain affordable access to healthcare through expanded Medicaid. For the record, Kasich is no fan of abortion rights, which explains why Ohio now has half as many clinics compared to when he took control in 2011. Ohio’s perennially petulant CEO showed how radical and grossly misinformed he can be, when during his second losing quest for president last year he echoed long-since debunked reports that Planned Parenthood was selling baby parts. Pathetic! With Washington Republicans facing a new forced march to pass a repeal and replacement bill for the ACA by simple majority vote before that procedural option times out at the end of the federal fiscal year on Sept. 30, the next worst idea Republicans are offering comes via the Cassidy-Graham-Heller-Johnson bill. If passed by reconciliation, a tactic that avoids a 60-vote filibuster rule, the legislation Senate Minority Leader Chuck Schumer of New York said “would cause millions to lose coverage” is barreling down the track in Washington. The exact extent of how bad Ohio would be hurt is not fully known since the Congressional Budget Office has not fully scored its devastating impacts nationally or on a state-by-state basis. One estimate by former Ohio U.S. Rep. Betty Sutton pegs the damage at $9 billion, just for Ohio. Experts who have analyzed the bill, though, say it would eliminate the ACA’s marketplace subsidies and enhanced matching rate for the Medicaid expansion and replace them with inadequate block grants. Block grant funding, a popular option for right-wing officials like Kasich and Portman, would be well below current federal funding coverage levels. Moreover, they would not adjust based on need. Portman and Kasich don’t like killing the ACA and its associated expanded Medicaid program immediately, but appear okay with squeezing the life out of it before 2026. Kasich revels in media adulation for defending Medicaid, when he’s actually only interested in the mountain of federal funds that he, like-minded GOP governors and legislators could spend it on virtually any health care purpose, with no requirement to offer low- and moderate-income people coverage or financial assistance. Portman voted for that Trumpcare bill, which didn’t pass when Arizona U.S. Sen. John McCain became the third Republican after Sens. Collins of Maine and Murkowski of Alaska voted no because of its many draconian provisions that target women. For added drama, Portman previously voted against a bill that included a bounty of money to tackle the opioid crisis, his prized issue now that Ohio leads the nation in opioid overdose deaths. At the time his bugaboo about the bill was that he didn’t like spending in other parts of it. Stranger still, the new and worse GOP Obamcare kill bill doesn’t contain funding to combat the opioid epidemic. Go figure. If this last try by Republicans succeeds, and it could if the right incentives are offered, Ohio’s block grant and medicaid per capita ration would drop by $2.512 billion by 2026. As many as one million people, many of them children, would be impacted by this bad bill. In spite of how much the GOP’s effort would have hurt Ohio had the bill passed, Portman voted for it anyhow, showing his north star on this critical issue is far out of alignment with what was good for his constituents. If Portman realigns his position to the one his governor-in-law friend Kasich and others expressed in this letter, Ohio’s junior senator can legitimately say he cast the correct vote for Ohio. Eliminate the ACA’s marketplace subsidies and enhanced matching rate for the Medicaid expansion and replace them with an inadequate block grant. Block grant funding would be well below current law federal funding for coverage, would not adjust based on need, would disappear altogether after 2026, and could be spent on virtually any health care purpose, with no requirement to offer low- and moderate-income people coverage or financial assistance. Convert Medicaid’s current federal-state financial partnership to a per capita cap, which would cap and cut federal Medicaid per-beneficiary funding for seniors, people with disabilities, and families with children. Eliminate or weaken protections for people with pre-existing conditions by allowing states to waive the ACA’s prohibition against charging higher premiums based on health status and the requirement that insurers cover essential health benefits including mental health, substance abuse treatment, and maternity care. Destabilize the individual insurance market in the short run — by eliminating the ACA’s federal subsidies to purchase individual market coverage and eliminating the ACA’s individual mandate to have insurance or pay a penalty —and risk collapse of the individual market in the long run. Eventually result in larger coverage losses than under proposals to repeal ACA’s major coverage provisions without replacement. The Congressional Budget Office has previously estimated that repeal-without-replace would cause 32 million people to lose coverage. The Cassidy-Graham-Heller-Johnson bill would likely lead to greater numbers of uninsured after 2026, however, because it would not only entirely eliminate its block grant funding — effectively repealing the ACA’s major coverage expansions — but also make increasingly severe federal funding cuts to the rest of the Medicaid program (outside of the expansion) under its per capita cap. One in five women in America have relied on Planned Parenthood in her lifetime. More than half of Planned Parenthood’s patients rely on Medicaid for care, and 56 percent of Planned Parenthood’s health centers are in rural or otherwise medically underserved areas. Under this bill, all Medicaid patients would be prohibited from coming to Planned Parenthood health centers for care – leaving many women with nowhere to go for basic care such as cancer screenings, birth control, STD treatment, and more. “We’ve seen what happens at the state level when policies like this are put in place, and they’re devastating,” PP said. 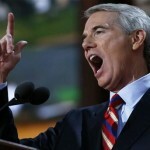 Playing hide and seek with how he will vote on such a monumentally important issue, there are suggestions based on comments Portman made recently that he might ignore his governor’s call to oppose the bill. “I don’t know how any senator could go home to their constituents and explain why they voted for a major bill with major consequences to so many of their people without having specific answers about how it would impact their state,” Schumer said on the Senate floor. Portman has another chance to show he knows what the right thing is for Ohioans, and is willing to vote for good bills and against bad ones. This is a bad one. Portman is on deck again. Let’s hope he doesn’t swing and miss like he did last time. Let The Sunshine In: The Public’s Right To Know Is Fundamental To Our Republic What’s That Area Code? 234 Is Akron – Right?